Polar Research and Policy Initiative Fellow Nic Craig sat down with Aleksi Härkönen, Finland’s Ambassador for Arctic Affairs, to discuss Finland’s chairmanship of the Arctic Council over the coming two years. The Fairbanks Declaration [link] from the ministers and permanent participants “provides a good basis for further work, containing all the elements we need for continued cooperation” according to Härkönen. As well as referencing the four areas of priority for the Finnish chairmanship (environmental protection, connectivity, education and meteorological cooperation), the declaration also gives emphasis to the Paris Agreement and Sustainable Development Goals (SDGs) that Finland is keen to pay special attention to over the course of the chairmanship. Another primary outcome of the May’s meeting was the Agreement on Enhancing International Arctic Scientific Cooperation [link]. Aleksi tells me that “the idea is to form a legally binding basis for scientific cooperation that is necessary. We will facilitate the exchange of students, researchers, equipment across borders and the transfer of data from country to country and institution to institution.” Addressing the concerns of some observers to the council, Aleksi confirms that the new agreement, far from discriminating against non-Arctic institutions, will actually strengthen cooperation between all parties interested in Arctic research, regardless of geographical location. As the chairmanship of the Arctic Council changed hands in May, Finland brings new priorities to the table with its ‘Exploring Common Solutions’ theme. From the outset however, the American and Finnish teams have striven for continuity. As Härkönen puts it, “the best way to strengthen Arctic cooperation is to strengthen the continuity; with only eight countries it should not be a difficult task.” As the telecommunications taskforce set up by the U.S. takes a new guise as ‘connectivity’, close collaboration with the Arctic Economic Council continues and work goes on to improve mental wellness, it is clear to see that themes from previous chairmanships are still being paid attention to. To aid such continuity in the future, Finland hopes to establish a set of commonly agreed long-term strategic goals for the Arctic that take into account the challenges and changes to come. Whilst early in the process, Aleski confirms that this will be on the agenda in the upcoming discussions between Senior Arctic Officials, and that Finland hopes to present a plan by 2019. One way in which the Finnish chairmanship hopes to strengthen cooperation in the Arctic is to hitch onto the wagon of recent major international achievements of the Paris Climate Agreement and the Agenda 2030 SDGs. Aleksi hopes that the SDGs will provide a useful toolbox for improving cooperation, particularly through the Working Group on Sustainable Development. The Paris Agreement is an obvious area for the Council to work together on given that climate issues have been at the heart of Arctic scientific work for a long time. How to implement the agreement, as well as protecting Arctic biodiversity, will be the main points discussed by Arctic environment ministers in a meeting to be convened by Finland next year. Bringing up the new U.S. administration’s planned withdrawal from the Paris agreement, Härkönen is clear: “Climate work in the Arctic Council will definitely continue…you cannot just close your eyes to the effects that everybody sees”. It is not breaking news that environmental protection, which has been central to the work of the Council throughout its history, will continue to be a priority going forward. Finland would like to find a way in which Arctic countries can speak with one voice in international climate negotiations to express a joint wish for results. Other areas of focus for the working groups of the council will be biodiversity, ocean acidification, microplastics as well as black carbon and methane emissions. Hydrocarbon extraction in the Arctic can often seem at odds with the goals of environmental protection. On this topic, Aleksi is clear that whilst the Council does not interfere with the energy policy of member states, it can assess the environmental and social impacts of such activities and provide recommendations to reduce such impacts. Härkönen cites the importance of involving observers here and the benefits that can be had from paying special attention to their views by arranging sessions where Arctic states listen to the observers of the Council. Continuing the work of the U.S. chairmanship on telecommunications, Finland will broaden the focus out to connectivity in its second priority area. Aleksi explains that the issue needs tackling from two angles. First addressing how to connect the Arctic region with the rest of the world, but also how to make life and living conditions better for the inhabitants of the Arctic. With so few taxpayers in the region, Härkönen describes how infrastructure investment is needed from the outside. 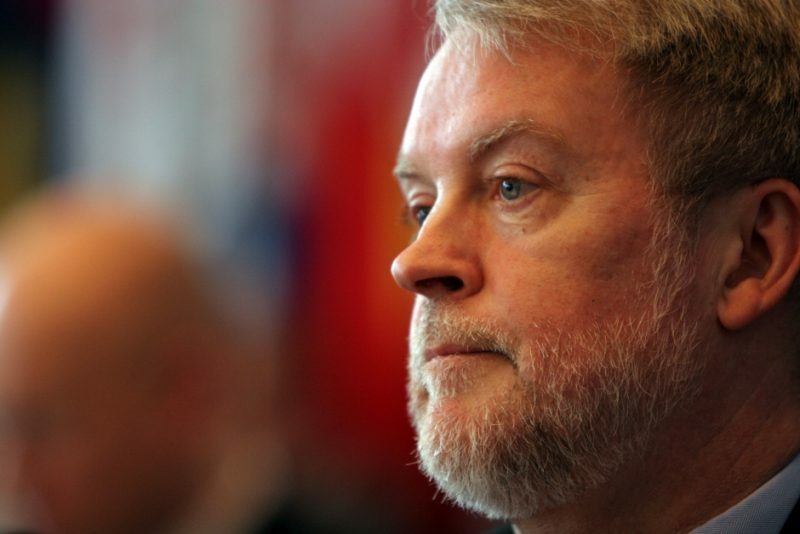 The role of the Council’s work here, he continues, is to cooperate closely with Arctic Economic Council and assess the needs and technical feasibility of increasing connectivity in the Arctic. Digitisation is sure to play a central role in this theme, as well as the more visible transport links and sea cables that can help to connect the Arctic to the world. Finland, with its technological knowhow that harks back to Nokia’s heydays, is well placed to lead on this issue. Aside from cold winters and warm saunas, Finland’s international brand is as a world leader on education. As such, Finland is primed to overcome the challenges to accessing education that accompany remote areas and small languages. At the heart of the strategy is involving the local population in the development of the Arctic, as Aleksi tells me “We should guarantee that everyone in the Arctic gets a good basic education and is then able to continue to further education, trade school or whatever other possibilities there are”. The spread of digitised material through improved connectivity will certainly improve access to education, but Härkönen also emphasises the core role of teachers and educators. By working with the University of the Arctic, Finland will look to develop new teaching methods and strengthen the network of education specialists in the region. The final priority for the Finnish chairmanship is improved meteorological cooperation in the Arctic. Whilst clearly important, meteorology is a less obvious area to focus on, so I ask Aleksi why Finland should take the charge on this, and why now? He quickly draws attention to Finland’s world class meteorological research, observation and services, stating that closer cooperation in this area would bring significant benefits to all stakeholders in the Arctic and strengthen the work of the World Meteorological Organisation. As the Arctic opens up to more tourism, international shipping and air traffic and the need for greater climate understanding becomes more intense, Härkönen says simply “the time is now”. Whilst Finland hopes to achieve a great deal in its time at the helm of the Arctic Council, the chairmanship can also benefit Finland and the Saami people. “We would like to strengthen Arctic cooperation to make our own neighbourhood safer in difficult international times and of course we would like to be a credible actor in the Arctic, in Northern Europe and even more widely” Härkönen explains, pointing to the global dimensions in all of the priorities Finland has laid out. Gesturing out the window to the harbour, Aleksi points out the latest addition to the Finnish icebreaker fleet; a first-of-its-kind ship that runs on LNG, bringing significant environmental benefits. This is an example of the plentiful Finnish cold-climate innovation and knowhow. Härkönen believes the chairmanship provides a perfect example to showcase such products and services to the world, particularly the fields of connectivity and meteorology. Turning the conversation to the Saami people, Aleksi points out the major benefits that the developing education and connectivity in the Arctic will have. Preventing marginalisation of the Saami will remain of great importance throughout the Finnish chairmanship. Härkönen mentions the strong relationship that the Arctic team has with Finland’s Saami parliament and the Saami council, with both groups closely consulted on Finland’s priorities for the next two years. As cooperation in the Arctic Council continues to flourish through difficult international times, my chat with Aleksi has proven that Finland is ready to take on the coming challenges at the helm of the organisation. The priorities of the chairmanship will bring focus to both new and old topics in the ever-evolving landscape of Arctic cooperation. Nic Craig serves as an Associate in the Energy Unit at Polar Research and Policy Initiative. Nic is currently completing an MSc in Climate Change at the University of Copenhagen. Nic holds a BSc in Geography and German from the University of Exeter, through which he spent a year studying in Helsinki. He has a background in renewables and energy policy and before moving to Copenhagen spent his time working on the Britain Stronger in Europe campaign. Nic is particularly fascinated by the new opportunities that a changing Arctic brings and the interconnectivity of natural, commercial and social factors.